The Railway line running along the main street of Fauresmith is a phenomenon which is found only in two other towns worldwide, namely Tula Homa, Tennessee, USA and in Wycheproof, Victoria, Australia. This old karee tree is located just north of the town hall. Under this tree rev Faure and rev Robertson served the first holy communion to 32 members of the Dutch Reformed church of the Rietrivier congregation on 9 November 1848. The tree is next to the Kosmos Cafe in the centre of town. 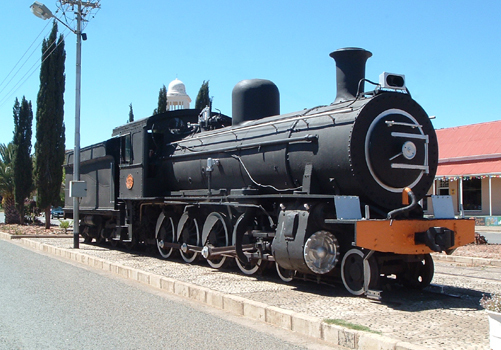 After long negotiations with the South African Railways by the old Town Council, they finally agreed to donate a steam locomotive to Fauresmith. After it had been mounted on its current location, it took one last trip down the main street, although it wasn't on own steam! At that time the district's schools participated in the "Snyman Cup", a rugby competition. Mr. Moos Visser promised the Werda team that he would fulfill their wish of 'taking a train trip' if they won. The Werda team defeated the Philippolis team in the final, and Mr. Visser then pulled the train off its tracks with his truck. Needless to say, it took a big effort to get it back on its tracks! Due to some creative welding, history cannot repeat itself. In 1868 and the early 1870's the Republic of the Orange Free State executed three murderers in public, approximately one kilometre from Fauresmith. The public was cordially invited to attend the executions. The first execution was that of a Richardt, a white man who murdered his wife in 1868 to be able to marry a younger girl he fell in love with. The second execution was that of a coloured man named Appels, who murdered a transport-rider where he was asleep under his wagon. Appels was executed on the same day, and the townfolk attended his execution in large numbers. The third execution was that of a black man who killed a mrs Rossouw where she was busy doing her laundry. In the cemetery one can visit the "Burger Monument". It was erected to commemorate the soldiers of the South Western Free State that was killed during the Anglo Boer War (1899 - 1902). In another part of the cemetery are 25 graves of British soldiers who died in the same war.